This article originally appeared in The National Interest under the title, "Russia is Reaping the Benefits of Israel's Actions in Syria." 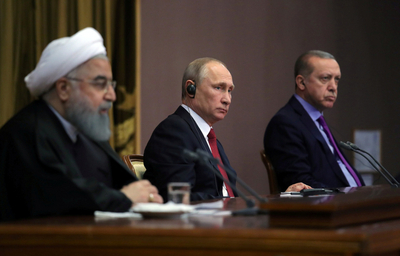 Russian president Vladimir Putin further cemented his position atop the Syrian power pyramid as a result of Israel's massive air campaign that targeted Iran's positions and Assad's air defenses. Dubbed by Israeli military planners as "Operation House of Cards," it was the most extensive aerial assault by the Israeli Air Force (IAF) in Syria since October 1973. Whether Jerusalem's impressive military success translates into a political triumph will be determined by how Tehran responds going forward, but there is little doubt Iran suffered a major setback in a week already full of monumental disappointments. In the meantime, Putin's strategic position in the Middle East has been enhanced and all he had to do was say, "Yes," to Israeli prime minister Bibi Netanyahu. Such an outcome was not guaranteed when Netanyahu met with Putin in Moscow, but the Israeli leader has his diplomatic ducks lined up in a row. Israel's comprehensive military response to Iran's rocket attack began just hours after the visit and received the Kremlin's blessing. The United States was notified in advance as well. "We told the Russians that we were going to strike in Syria, but we didn't tell them where exactly we were striking or what the targets were," a senior IAF officer told the Times of Israel. He added, "The [de-confliction] mechanism worked to its fullest and we preserved our freedom of operation." The Kremlin's accommodating stance toward Netanyahu's concerns, including the lack of criticism toward Israel in the wake of the attack was a new development that was no doubt welcomed with relief in Jerusalem. That is because Russia has played the role of arbiter since its September 2015 entry into the Syrian war on behalf of the beleaguered butcher, Bashar al-Assad. For several years, Russia's growing presence posed an obstacle to Israel's enforcement of its red lines, requiring deft diplomacy on Netanyahu's part to arrive at an understanding over Israel's operational parameters and manage the deconfliction line to avoid military mishaps. With close to ten meetings between Netanyahu and Putin since 2015, Israel and Russia have managed to avoid operational accidents but have not been on the same page regarding Iran's place in Syria's future. For example, the parameters of the 2017 southwest Syria ceasefire and de-escalation zone—both efforts spearheaded by Moscow—did not take into account many of Israel's security concerns. Even more, the joint U.S.-Russian statement in November 2017 called for the "reduction, and ultimate elimination" of foreign fighters from southern Syria as part of the de-escalation zone's creation but a few days later, Russian foreign minister Sergey Lavrov referred to Iran's presence in Syria as "legitimate" and said Russia did not commit to ensuring the withdrawal of Iran or its affiliated militias. Russia also let its displeasure with Israel spill out into the media after its February and April strikes against the T-4 air base in Homs province, a major aerial logistical hub for the Islamic Revolutionary Guard Corps (IRGC) where Russia also maintains a presence. There were reports that after Assad shot down an Israeli F-16 during the February mission that Netanyahu was ready to green-light a more comprehensive military response but scaled back after receiving "a furious phone call" from Putin. Russia was likewise incensed after Israel's airstrike at T-4 in April, which destroyed Iran's soon-to-be-deployed advanced short-range air-defense system, the SA-15 (Tor missile system). The Kremlin's tangible punishment would be delivered in the form of its sale of the SA-10 (S-300) air-defense system to Assad. The rising Israeli-Russian friction was unmistakable. Yet somehow following Netanyahu's meeting in Moscow and the successful execution of Operation House of Cards, Russia backed off the deal. Even more interesting was the context in which the decision was made public. "For now, we're not talking about any deliveries of new modern (air defense) systems," top Kremlin aide Vladimir Kozhin said when asked about the possibility of supplying Syria with the S-300. Kozhin added that the Syrian military already had "everything it needed," which is a remarkable comment given that Israel destroyed the lion's share of Assad's air defenses after being targeted during its operation. The removal of these obstacles and gaining Putin's tacit approval is a major development that would appear to be the result of Netanyahu convincing the Russian president of the following: first, that Israel's only interest was in responding to Iran and its affiliated proxies in Syria. It had no issue with Russia's position in Syria and would not target Assad or his defense assets. In fact, Israel would even warn Assad to stand down once the operation commenced. If Israel had to respond because Syrian forces foolishly decided to engage, then Israel would take out those targets but leave Assad personally unharmed. Nor would it widen the conflict to Lebanon if Iran did not order Hezbollah to attack from there, thereby avoiding the apocalyptic predictions analysts have warned about for years. In short, the operation was presented as limited in both duration and scope, only targeting Iran's assets, and maintaining the overall arch toward Syrian stability. Or, to put it in Obamacare sales-pitch lingo: "If you like your Assad puppet Syria provider, then you can keep it. This only impacts Iran." Regarding the transfer of the S-300, Netanyahu likely impressed upon Putin that the delivery of the system to Syria would constitute the crossing of a red line and would be immediately targeted as a threat to Israeli security. On the other hand, the deployment of the more advanced S-400 system near Russia's coastal bases—strictly operated by Russia's forces—was acceptable as it arrived a while ago in response to Turkey's downing of their Su-24 fighter plane in December 2015. That should suffice given that the S-400 is a world class air-defense system and Russia was not on Israel's Syrian menu. This understanding in advance of the operation apparently allowed Israel to first target IRGC and Hezbollah positions in al-Kisweh (just south of Damascus) and in Quneitra (adjacent to Israel's Golan border) using only F-15 and F-16 fighter planes as the air component. If Israel believed their planes would either be targeted by the S-400 or that the information it gathered would be passed on to their Syrian counterparts waiting to ambush, the IAF strike configuration would have likely prioritized the removal of the threat posed by the air defenses before turning its attention to Iran's command and control headquarters, intelligence facilities, logistical command sites, observation posts, missiles storage facilities, ground operations staging areas and so on. Open source reporting did not indicate Israel used its F-35 "Adir" stealth aircraft, nine of which were declared operational as part of the IAF's elite Golden Eagle Squadron. Russia could have complicated the picture considerably by forcing a showdown with Israel over what Jerusalem considers to be a nonnegotiable security red line. As one former member of Israel's elite Unit 8200, the Military Intelligence Directorate's main information gathering arm told me in February, "You don't fight with the Russians to defeat Hezbollah. We did that in the 1970s, downing Russian pilots to be able to fight in Egypt. I don't think the bill is worth it at the end of the day." Putin judged such a decision as against his interests, which is defined in Syria as maintaining his expanded military presence and preserving his enhanced role as a regional arbiter. He may be coming around to the idea that he can accomplish that without Iran and against the wishes of Assad, who will become more dependent on his good graces if Tehran's position recedes. For Vladimir Putin, the path to consolidating his Syrian achievements may lie in an agreement with Israel that further solidifies Russia's status, and with the United States, which is focused solely on ISIS in eastern Syria and plans to withdraw. That could mean two things: The first is that the Iranian date Putin brought to the Syrian party is not as attractive as the Israeli he met at the ball. The second is that Israel's operation may have exposed the nature of Iran's gains in Syria as nothing more than a house of cards, vulnerable to the aerial forces that blow in unabated from the south.